We are happy to announce that Kuula and Insta360, the world leader in producing 360-degree cameras, have agreed on a partnership. Our goal is to deliver the best quality virtual tour capture and editing solutions for our clients and customers. We’d like to take this moment to thank you for being part of Kuula community and to wish you and your loved ones a very happy Holiday Season! This was a remarkable year and we’d like to thank you for that! Martin Kulhavy keeps going to the Lofoten islands in Norway to take stunning 360° captures. The Virtual Tour that he created will allow you to explore the archipelago even better than before. We just launched a HUGE update of the Virtual Tour editor! The latest update includes functions such as background sound loops and interactive audio, inline images, custom hotspot icons, custom fonts and nadir/zenith patches. With those features, you will take your Virtual Tours and VR Presentations to the next level! 360 spherical images are cool when viewed in a Virtual Reality headset. But what is even cooler are 3D images! With 3D images you can not only look around you but also get a feeling of depth. There’s nothing like it for a feeling of true immersion. The best way to create a 3D image is to use one of the cameras that supports it – like Insta360 PRO or Detu Max. Otherwise, most 3D rendering software can render in stereo and you can also make 3D game screenshots using NVIDIA Ansel. Kuula now supports 3D images. Just upload them just as you would any other 360 images, put on your VR headset and enjoy! This feature is available to all users – PRO and free. Here’s a tutorial with more information about this function. What if you could you improve your Virtual Tour, make it more immersive and engaging, with one click? 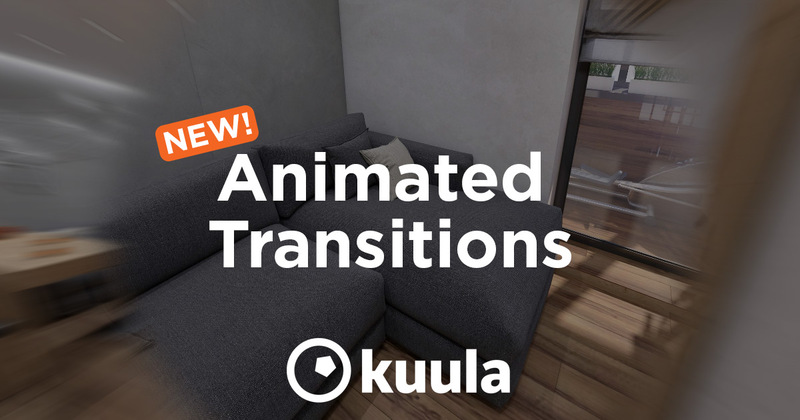 Now you can do that, thanks to our new Animated Transitions feature! Since we launched the Virtual Tour editor, a lot of you have been asking for a feature to replace images in a post. And now, it’s here! WebVR comes to Kuula – experience Virtual Reality in your browser! We’re happy to announce the release of the most anticipated feature of 2018: WebVR support. We just launched a new feature on Kuula: support for regular, non-panoramic images. You can now upload custom floor plans, maps or cover images to your tours & add hotspots to them in the same way as you would add them to 360 photos. We hope this will help you in building great virtual tours! Recently we updated Kuula introducing changes to the Virtual Tours user interface and workflow. We believe it’s a step towards making it easier to upload and manage photos and virtual tours on Kuula for both our PRO and free users. Here’s a guide to what’s has changed. Ruben Frosali is an artist from Italy, but now he lives in Japan. He is involved in improving and pushing his 360/VR imageries further, both artistically and technologically. In this article, he shares what techniques he uses to transform 360 images into amazing futuristic VR experiences. A million thanks for being with us and Happy Holidays! During this Holiday Season, we wanted to take a moment to say Thank You for being loyal to Kuula and extend our warmest wishes to you and your family. Amazing things happened at Kuula this year. We launched Collections and Virtual Tours. We created the Embed Editor that allows to customize and brand your posts. We launched a VR app, we added New Lens Flares, a Batch Upload and many more. The sun & lens flare is an image effect you can add to your posts. With this effect you can make your photo look much more dynamic in a few seconds. It’s unique for Kuula and it’s very popular among our users who used it on thousands of uploaded posts! While we are working on some big features coming soon to Kuula, we recently deployed a number of smaller changes based on your feedback. Here’s a list of what is new! Martin Kulhavy shares his 360 photos from Lofoten in Norway, where he spent a couple of weeks traveling. His 360 photography is exceptional. Let him take you to this scenic place and start exploring. We are excited to introduce you to our new feature: Virtual Tours. They will help you organize your posts and share them with others. Click on the photo below to see a live example. Many of you asked us for a Batch Upload function to be able to post & organize photos faster. Since we always listen our users’ feedback, we’re happy to announce that the 360 Batch Upload is here! As of April 2018, the Batch Upload section was renamed to Create Tour. The basic functionality is similar, the main difference is that it’s easier now to create a tour out of all the uploaded images. James Boddie created an awesome and historically acurate reconstruction of the Alamo Mission in San Antonio, Texas. The resulting 360 panoramas show what Alamo looked like back in 1836, just before the famous battle. In this article James gives us some historical background and explains what tools he used create the model and how he rendered it in 360 using Blender. Enjoy! JL Mast is an artist and illustrator from Lille, France. He works with MARVEL on titles including Daredevil / Punisher Infinite, A Year of Marvel: Amazing Spider-Man, Guardians of the Galaxy & Avengers Millennium. He loves 360 drawing and as part of the Inktober initiative, he decided to draw a new image everyday this month. In this article, he shares his 360 drawing workflow and techniques. In this article, I would like to tell you about how NVIDIA Ansel 360 game screenshots and Kuula can work together. Kuula is already home to thousands of 360 images made with Ansel and you can easily upload and share yours! Keep reading to see how to do it. Event though Instagram does not support 360 photos – this is what Kuula is for 🙂 – you can create tiny planets of your 360 images using Kuula Tiny Planet Editor and post them on your Instagram account. 360 game screenshots are a relatively new thing. The technology behind them is called Ansel and it was released by NVIDIA in 2016. It allows gamers to capture in-game shots in 360 degrees using a simple keyboard shortcut. Since it’s release, thousands of 360 game screenshots have been shared by Kuula users. En este espacio me gustaría hablarles sobre la buena conexión que puede tener Nvidia Ansel junto a Kuula y su servicio para fotografía en 360°. Kuula alberga miles de imágenes en 360° realizadas con Ansel. Usted también puede subir y compartir sus fotografías en 360° del juego. ¡Quédate en este post y veras como hacerlo! The most important factor for online success is to engage your audience. Your content needs to stand out in the crowd and 360 photos will help you achieve that! 360 photos are interactive, engaging and relatively new, which makes users very curious about them. Our mission at Kuula is to allow you to embed 360 photos on your website and easily integrate them with the rest of your content. With 359 million blogs and over 500 million monthly visitors, Tumblr is probably the most popular microblogging platform in the world. People love it because it’s very easy to use and has a very active a lively community. Can you share 360 photos on Tumblr? Now, you can! Samsung Gear 360 is one of the most popular 360 cameras available on the market. A lot of users on Kuula upload photos made with that device. However, before you start shooting and sharing 360 panoramas with a Gear 360, here’s one important thing you need to know about it’s stitching process to avoid problems with displaying your photos. Some of you approached us saying that you would like to have the Auto rotate mode on your 360 embeds. We listen and we have integrated this feature to Kuula Embed Editor! We’ve been listening to your feedback and here it is – Facebook social login has been integrated to Kuula! We just launched a new feature on Kuula that a lot of our users asked for. You can now share the GPS location and other camera information on your posts! Location shows GPS coordinates and the name of the place where the shot was made and it’s linked to a mini map. The camera information provides data such as device model, focal lenght, exposure time, aperture and ISO and it might look something like this RICOH THETA S – 1.31mm / 1/8s / ƒ2.0 / ISO 100. You can now choose to share this information with your viewers with one click in the post editor! This new function is available for all our users – PRO and free. Here we come with a new selection of amazing 360 photos that have been posted to Kuula. Congrats to those who have been featured this time! We listen to our users and we have removed the limit to create public Collections in our Basic plan. Now you can create as many as you want, for free! Thank you everyone for such a positive feedback regarding our new Collections feature! Some of our users asked if we could add a button that will allow to create Collections even faster than before. And here it is 🙂 ! Here is another selection of the most breathtaking 360 photos that have been posted to Kuula recently. Congratulations to all those talented photographers that have been featured this time! We’d like to present you 360 photos from Hong Kong, Portofino and Dubai, such different cities, but all amazing. Just have a look and immerse yourself into their beautiful surroundings! Did you know that Kuula has an easy-to-use Embed Editor? Now you can even create embeds with your own logo and you can adjust the way the embeds look. This post is a quick tutorial how to create embeds and add 360 photos to your website, to an online magazine article or to a blog. This article was written by Daniel, creator of threesixtycameras.com – A website dedicated to reviewing and comparing all 360 Cameras. Want to produce high quality 360 images? Make sure your camera can shoot in 4K! I don’t know about you, but I’ve spent more time than I’d like to admit exploring the featured photos on the Kuula home page. 360 degree photos are an exciting new medium that people are responding too positively. Being able to capture everything around a camera instantly is something that was unimaginable just 10 years ago. But here we are, Kuula is already full of thousands of amazing 360 photos and if you want to add to the collection, you need to make sure you have the right camera. Adding photo albums to Kuula was, by far, the most requested feature by our users. We listened and we’re happy to announce that we released the Collections feature. You can now easily organize your own posts and posts of others you like into Collections. When they are ready, share & embed them. This post is a quick tutorial how to create and manage Collections on Kuula. Thrilled to exhibit at VRLA on 4/14 & 4/15! Will we see you there? We’re thrilled to announce that Kuula has been invited to VRLA Expo 2017, the world’s largest virtual and augmented reality expo, on April 14th and 15th at the Los Angeles Convention Center! At VRLA, you can join thousands of immersive technology professionals and enthusiasts, and see cutting-edge demos of the most exciting projects in development for the Oculus Rift, HTC Vive, PlayStation VR, Microsoft HoloLens, Samsung Gear VR and more. Kuula is one of them! Come see us at the Indie Zone and enjoy Kuula stunning 360/VR images we’ll have there for you to see in Kuula VR app! You’ll be able to browse our photos like they deserve to be seen – being fully immersed in VR! Kuula users post hundreds of 360 photos and images every day – many of them are amazing! This post starts the “Editors’ Picks” series, in which we’ll be sharing the best of the best on Kuula. Many talented photographers and 3D artists have demonstrated their skills capturing well-executed photographs of landscapes, cities, lifestyle scenes or creating breathtaking 3D renders and illustrations. We chose the below images because we feel they best represent the diversity, creativity and the potential of 360 photos. We hope you enjoy them as much as we do. Congrats to all those who have been selected! Kuula is all about sharing your 360 photos with the community, so tagging and describing your work is important. If you tell the story behind your post, you can add some context to what users see. Adding tags helps them find your 360 photos. This is why we encourage everyone to add descriptions and tag their posts! This article has been move to our Support section. You can find it here. The best way to experience 360° photos is in virtual reality. That is why at Kuula, we created a dedicated application. Now you can browse all our photos like they deserve to be seen – fully immersed in VR! There are hundreds of virtual reality headsets avaialble on the market, some of the are great others, not so much. 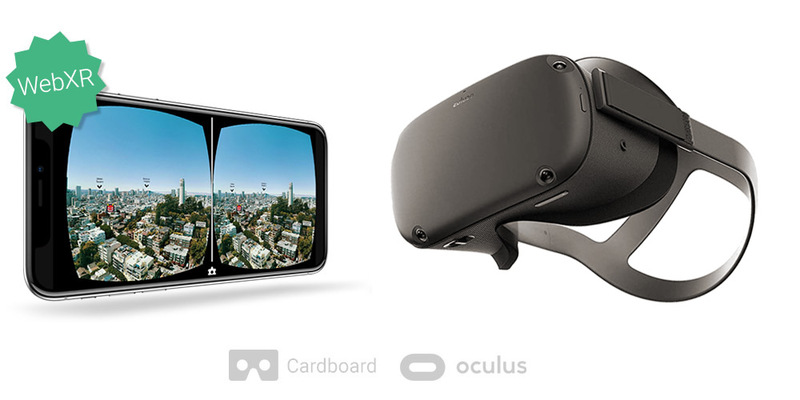 This article will help you choose the right headset for the best VR photo experience.